This is a great recipe to do with the kids, so easy, so much fun. It's a treat that all kids love, big kids included. 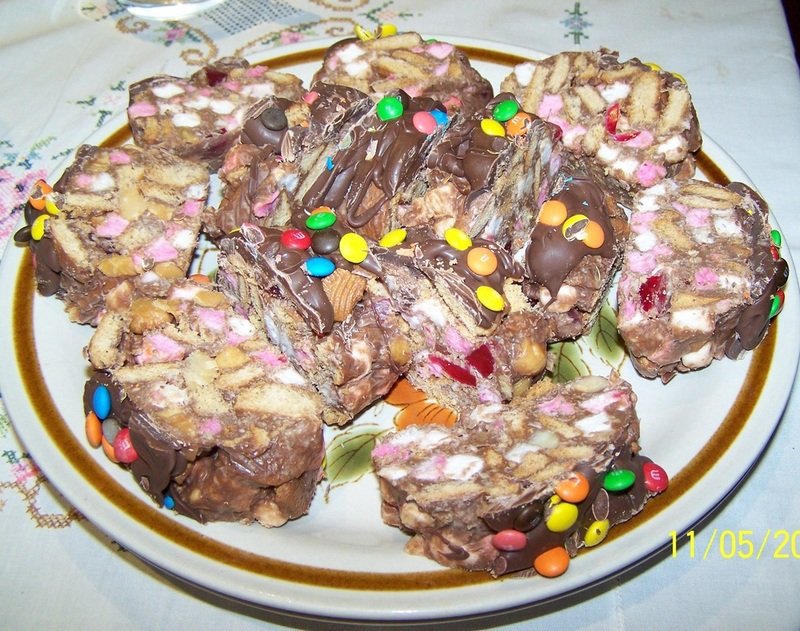 It has biscuits in it, lollies, marshmallows, nuts, coconut and chocolate to name a few ingredients. This is something I make when I need something sweet. Most of the ingredients i'll find in my pantry. You can add stuff, take stuff out, substitute ingredients, use what you have. In the picture you can see I added mini m&m's. I love it, the kid in me comes out when this gets put on the table. Put crushed biscuits into a large bowl. Add the raspberry jellies, nuts, marshmallows, coconut, condensed milk, chocolate and butter, mix well. Divide the mixture in half, roll each half into a 30cm long log. Wrap each log in cling film, then roll in aluminium foil. Refrigerate until set, preferably overnight. Remove the foil and cling film. Place the logs on a tray. Drizzle each roll evenly with the extra melted chocolate. Refrigerate until set. Cut each log into 1cm slices. Serve.